Allow us to walk you through this scenario: One day, John Smith, a random art lover, visited a gallery and fell in love with a painting which he wanted to buy to decorate his living room, however, the exorbitant price exceeded his appraisal. He believed it was not a fair offer but there was no evidence for him to confirm it. The smiling art dealer had this painting, information about the artist and all other documents regarding the painting, while John had nothing. Even though sparks flew between John and this painting, he still ended up leaving empty handed. Has something like this happened to you? Things can be quite different if there is an blockchain database with rich resources about art. By searching the database, people are able to look up the artist and this artwork thoroughly, like, when and where this artwork was created, trade records of the artwork, and background of the artist, provenance etc. Meanwhile, data on blockchain is also tamper-proof and transparent, which ensures everyone is capable of getting an appraisal. Freyrchain packed itself not only with the blockchain data but also the off-chain data. Unlike other art + blockchain project who are looking for partnership with auction house and uploading data on the blockchain in the future, in the past decades, Freyrchain has been collecting old books, literary books and documents about artworks. 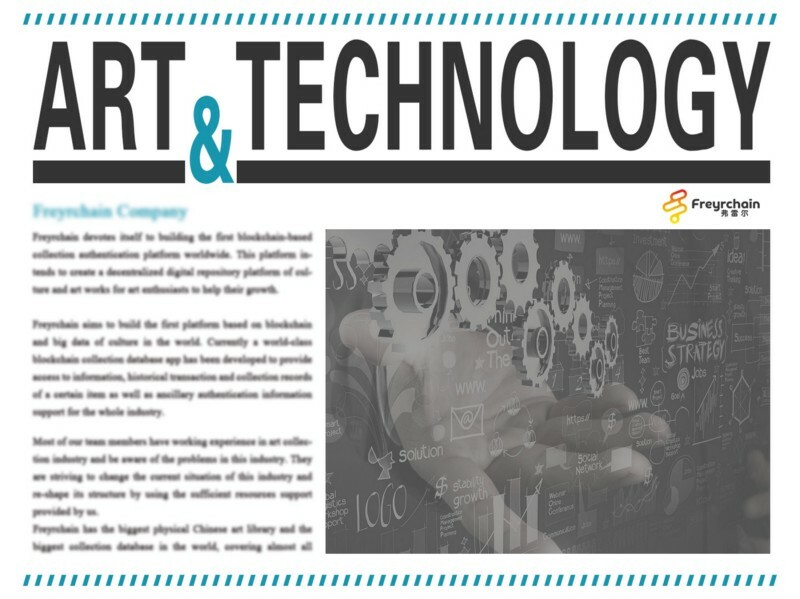 The company is currently adhering to the concept of technological innovation and has a number of intellectual property rights in the use of blockchain technology. Since 2006, its professional team has accumulated a large amount of Chinese art and cultural collection materials, such as books as well as publications, and digitized nearly 20,000 copies of the substantive texts collected since 2010; thus, the world’s most comprehensive Chinese art database is available from that time. With further development, this team has collected and digitalized even more books as well as publications about all kinds of art; hence, currently, Freyrchain has the biggest physical library and the most extensive artwork database covering the most widely known Chinese art books published in the world as well as art books on other countries. The digitalized art book in the database with the longest history is the Yu Zijun Imitates Huaisu’s Cursive Script in Thousands of Words created in 1470 (Ming dynasty, Chenghua 6th year), as for art of other countries, the physical material with the longest history is the Complete Works of Shakespeare of the 1593 edition and the one with second longest history is the Ancient Jade Map whose owner was Qianlong (a famous emperor of Qing dynasty) published in 1752. In the future, Freyrchain will continue to input more and more data on all kinds of art in this database using the blockchain technology. Art enthusiasts and collectors are able to look up art related data on this reliable database for any information they may need. We can expect that with information flowing more freely, buying a piece of artwork or being an art collector is not too difficult to succeed.